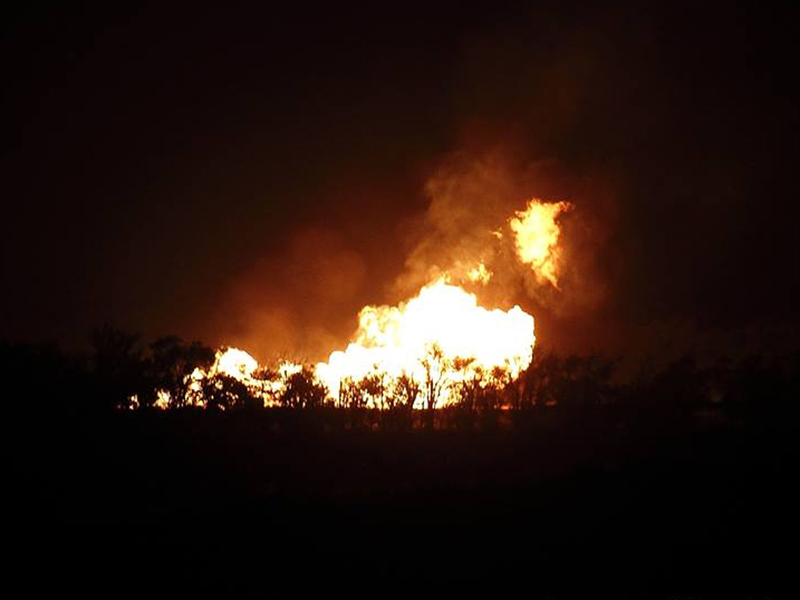 A pipeline explosion in rural northwestern Oklahoma sent flames shooting into the night sky early Monday. Deputy Cliff Brinson, of the Harper County Sheriff's Department, says the fire sounded like four roaring jet engines and had flames reaching two football fields high. He says no injuries were reported, and residents within two miles of the blast were evacuated. A family of three living in a home about 200 yards away escaped unharmed, authorities say. Engineers with Northern Natural Gas rushed to the scene and cut off the natural gas flow to the 30-inch pipeline. Company spokesman Mike Loeffler said that, as of 6:30 a.m. ET, the fire was almost out -- only "a small flicker." He said the rupture's cause isn't known, and an investigation team will examine the damaged pipe before repair work begins, adding that in the past, similar investigations have taken days to weeks to complete. Service was never disrupted and the situation is completely under control, Loeffler said. CBS Oklahoma City affiliate KWTV received numerous phone calls and e-mails from viewers saying blaze could be seen from southern Kansas and across the Oklahoma Panhandle. 75 firefighters from Oklahoma, Kansas and Texas were on the scene and, despite the size of the flames, the fire was considered under control. The blast rang out at 11:35 p.m. ET, and authorities shut down nearby Highway 283 as a precaution.